Adaptations can serve two purposes, but usually only one or the other. An adaptation can present a well-known story from a new perspective, be it more descriptive or different visually, or it can genuinely serve as the consumer’s first interaction with a story in a medium familiar to the reader. Given the incredible success of The Force Awakens, the Marvel Comics’ six issue adaptation of the Star Wars blockbuster must fall into the first of the two possibilities. Written by Star Wars Aftermath trilogy author, Chuck Wendig, with art by Luke Ross, the adaptation succeeds in presenting a story that many know well with fresh perspectives. Wendig focuses on keeping the dialogue flowing, not often giving over to excessive conversation. Wendig does forsake his present tense style of his Aftermath trilogy, so for those who take issue with that creative decision, they need not worry about it in the comic version of the film (after all, it’s almost entirely dialogue). Given that the adaptation is between two visual mediums, the real challenge falls on Ross to figure out how to capture the most exciting movements of the film on paper and at the same time, deciding when to step away from the letterbox framed visuals of the movie. Both succeed in this endeavor. Specifically, Ross jumps back and forth between traditional framing and allowing his characters to break out of the white border constraints. 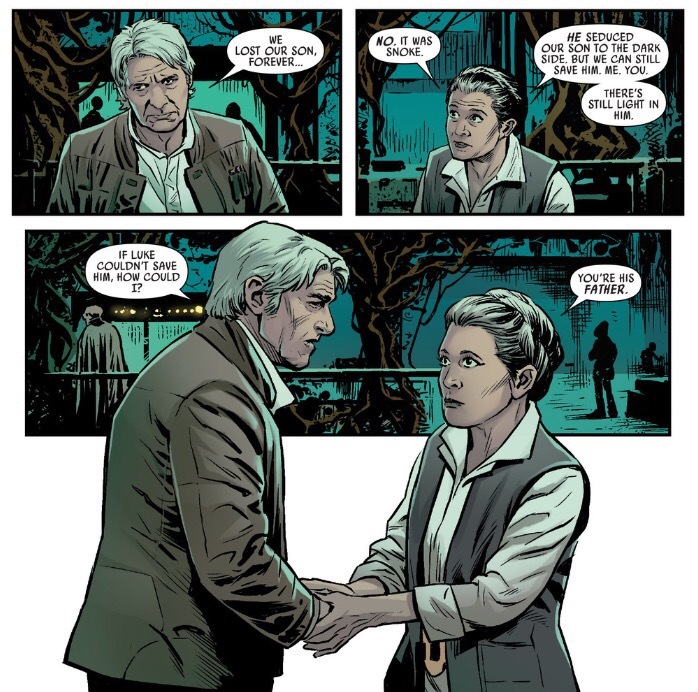 One of Ross’ most clever illustrations involves a conversation between Han and Leia, which begins with the characters separated in opposing frames and then in descending order which reflects the dialogue, Ross brings our favorite smuggler and general closer and closer until they share a single frame. Ross displays this type of creativity through out the adaptation. Perhaps the real question is whether the adaptation is worth one’s time, given that nearly everyone knows the story, the characters involved, and even the shocking death at the end. If one loved The Force Awakens, then they will definitely enjoy seeing the story told in this incarnation. While every page turn does not hold new secrets to behold, it does hold the promise of challenging the mental images we all own of our favorite moments in the film with Ross’ art. For those who love comic books and fancy Star Wars, it really depends on how much one loved the movie. Unlike Marvel’s other Star Wars titles, it offers nothing new to the ongoing stories of our heroes in the franchise’s universe. The art by Ross, does not always capture the likeness of its heroes, but as mentioned above remains a constant enjoyment from page to page. 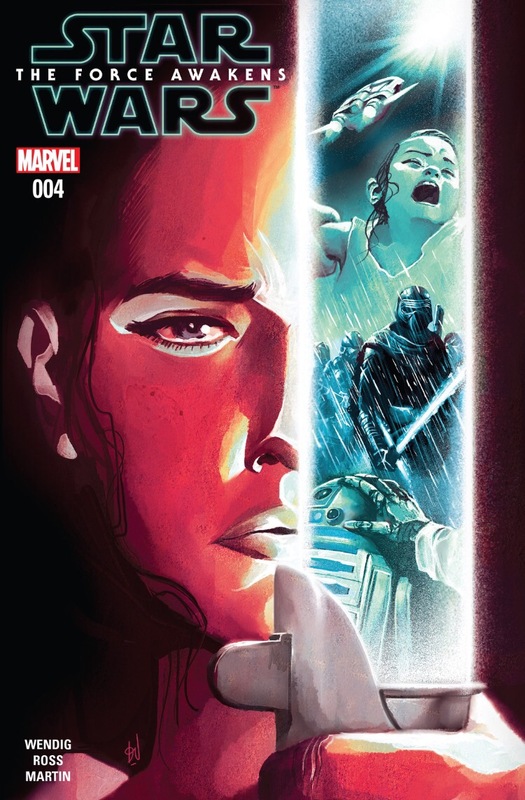 For those who like Star Wars, but do not have a great fancy for The Force Awakens, and do not often read comics, this adaptation probably isn’t for them. Overall, both Wendig and Ross succeed at the task before them, translating a highly successful installment of the Star Wars cinematic universe into something which can be admired on its own merits.